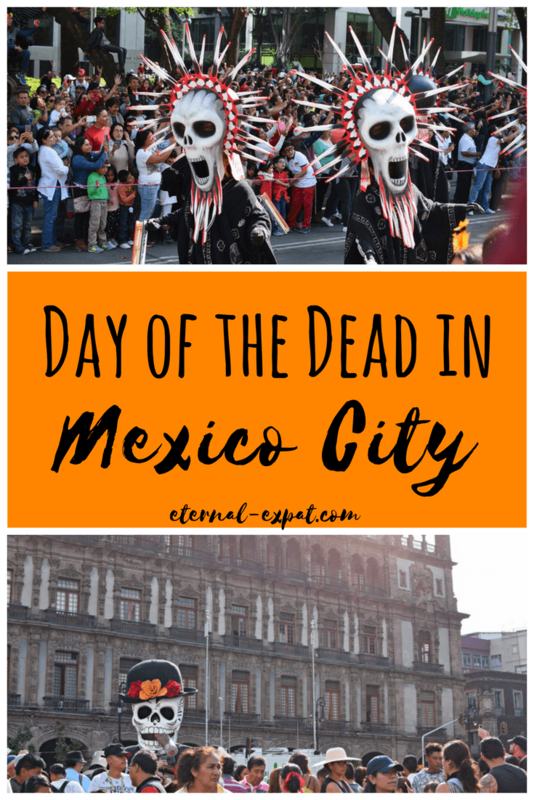 Day of the Dead in Mexico City is an exciting time to visit. It’s nothing like I was expecting and it’s certainly nothing like Halloween, that’s for sure! 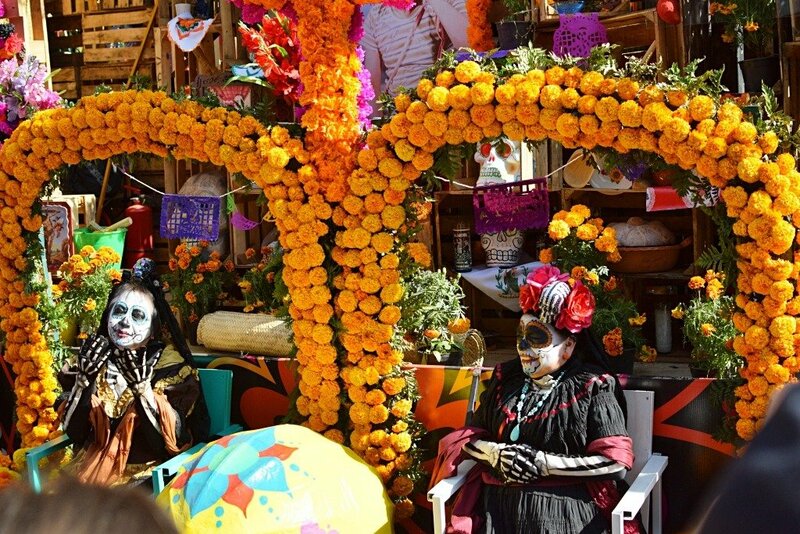 Day of the Dead is a fascinating experience and while it’s celebrated differently around the country, you’re sure to get a better understanding of it with a trip to Mexico City. Day of the Dead, or Dia de Muertos, is a celebration of the lives of those that have passed. Dia de Muertos has been a day of remembrance since before the arrival of the Spanish. In fact, before Spanish colonization, Dia de Muertos was celebrated in the summertime. It wasn’t until the Spanish had to figure out how to make this holiday a little more, well, Christian, that it was moved to the same dates as what many people know to be All Souls Day – November 1st. Originally, the holiday was only really celebrated in central and southern Mexico. The indigenous people from the northern part of Mexico had different celebrations and customs. Some people believe that the spirits of the departed visit on October 31st and leave again on November 2nd. Now the holiday has taken on a slightly more commercial form, especially here in Mexico City. If you want to experience Day of the Dead the way the more indigenous people still celebrate it, you’ll have to head to areas around Oaxaca or Chiapas. 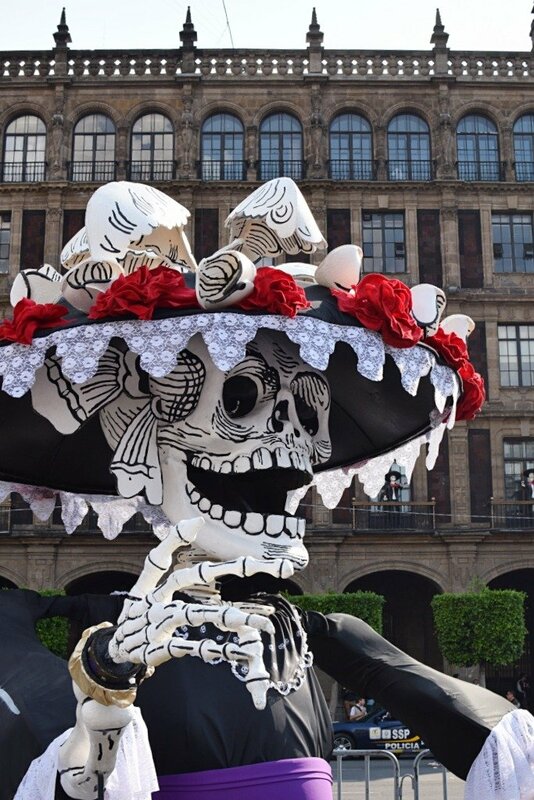 If you’ve ever seen pictures of Day of the Dead celebrations in Mexico, you may be familiar with the image of a female skeleton wearing a big hat. The Catrina represents the “Lady of the Dead,” which was the goddess that the pre-Colombian people worshipped waaay back when these celebrations first began. There are two main days which are part of Day of the Dead – so technically, it’s kind of Days of the Dead. November 1st is referred to as Día de los Inocentes, or the Day of the Innocents. This is when people honor children and infants that have passed away. November 2nd is Día de los Muertos or Día de los Difuntos. This is when people acknowledge the lives of adults that have passed away. The city decided that as a way to bring more tourism to the downtown area, they would start having a parade. 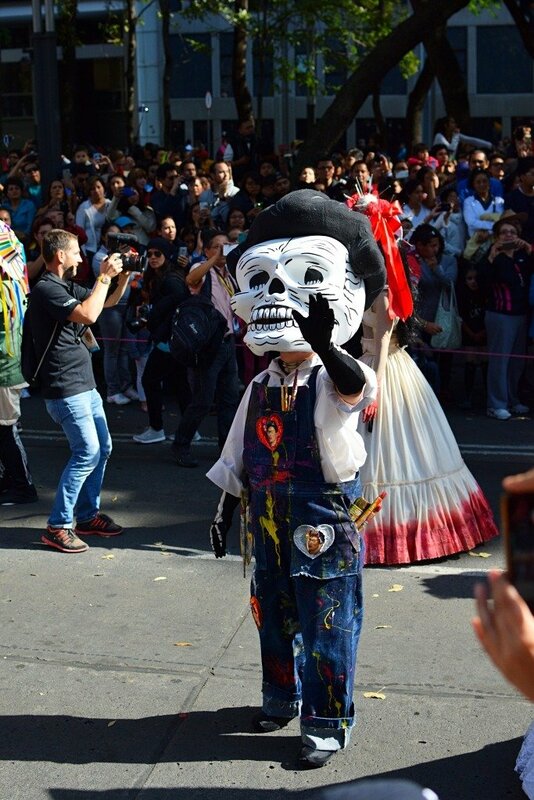 So in 2016, Mexico City had the first official Day of the Dead parade. 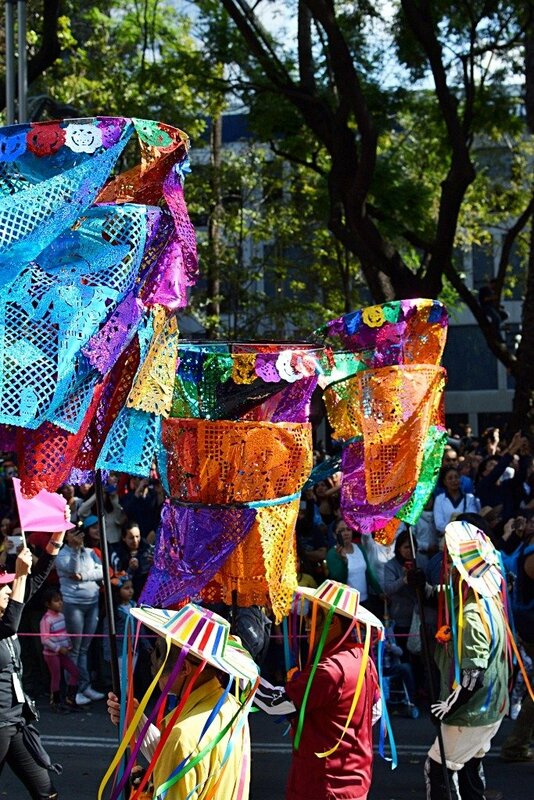 Word is that this will continue to be an annual event and you can look for it along Paseo de la Reforma on the last Saturday of October. Another thing you can do on Day of the Dead in Mexico City is to head to the Zocalo. The main square is packed with traditional shrines made with the holiday’s signature bright yellow marigolds. There’s a stage where different Mexican bands play everything from Mariachi music to classic Mexican Banda. Things really get going here at night when people dress up in different scary costumes a-la Halloween style and do their best to scare the crap out of you. I also recommend spending some time in more local neighborhoods like Coyoacan or Mixquic. Here you’ll be able to see how locals spend their time. Just be sure to be respectful and remember that people may be drinking and having a blast, but this is a family and close friends sort of holiday. People are still commemorating the lives of those they have lost. There are some really great tours out there that will take you to parts of the city that you might not want to or know how to get to on your own (especially with limited Spanish). I highly recommend this tour with Mexico Underground. I personally know the guide, Ubish, and he is a total wealth of knowledge about Mexico, Mexico City, foods, history, and of course, Dia de Muertos. On this tour, you explore the chinampas where they grow tons of the beautiful marigolds used during this time of year. It also includes a nice dinner of local foods and then a visit to a cemetery where locals are dining and celebrating the lives of those that have passed. Another option which is on October 31, is with legendary Mexico City foodie, Anais of the Curious Mexican. If you want to enjoy a combination of Day of the Dead exploring and amazing food and drinks, then you should take this tour with Anais. It includes a mezcal tasting, a Mexican craft beer tasting, a walk around the flower altars in the city, Day of the Dead bread (a must-try at this time of year), and tacos! There has yet to be any information released for Day of the Dead in Mexico City for 2019. The parade dates are usually released MUCH closer to the time of the festival. 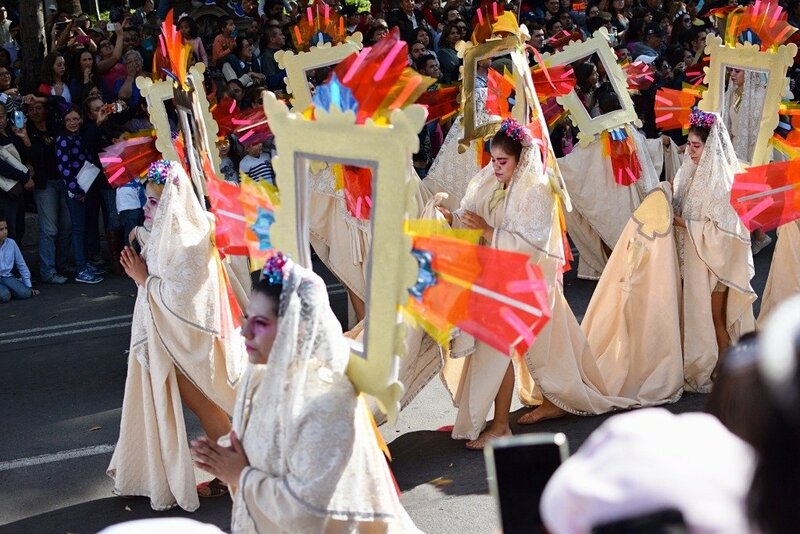 In years past, the parade usually falls on the Saturday before Day of the Dead. However, since this year it will fall on a Friday/Saturday, that may change. I will update this post as soon as I know more details about this. The Day of the Dead Festival in Mixquic is always on the night of the First and Second of November and is quickly becoming more and more touristy. I think this year will see more tourists than ever before. That means getting in and out via Uber will likely be nearly impossible. I recommend booking a car service to drop you and then meet you somewhere to bring you back to the city center. Alternatively, you can take the metro and then the bus which is very cheap. Many people simply celebrate Day of the Dead at home behind closed doors where they have built or bought their own shrines to commemorate their loved ones. However, if you are looking for the most public place for celebrations, you’ll find those at local cemeteries, not in the streets of Mexico City. The city is incredibly crowded on the nights of Dia de Muertos. People want to see what the city has put on, just like you do. Have patience, look out for your belongings, and just be prepared to wait as you walk down Madero to the Zocalo. Try to avoid taxis or driving in general during these days. The traffic in Mexico City is never good, but it is especially bad over this period. You’ll likely just be sitting in traffic most of the day. If you do decide to go to a cemetery, I recommend that you don’t go alone. It’s a holiday that includes a fair amount of alcohol and just like any major city, you never know what to expect. That being said – it’s a pretty merry time and visiting the cemeteries during this time is a very interesting experience. If you want to experience downtown Mexico City during the Day of the Dead, then staying in the city is the best option. My favorite boutique B&B in the center is definitely Chaya B&B. It’s located right next to Alameda Park and the Palace of Fine Arts and is within walking distance of the Zocalo. I wrote a full review of Chaya B&B here. Book your stay at Chaya B&B here. I also recommend checking out Airbnb. There are tons of places in the historic center at a reasonable price and it means you can also self-cater since you’ll have a kitchen. I’ve put together a whole list of the best Airbnb places that I’ve found in Mexico City here. If you’ve waited a little bit too long to book or you prefer bigger chain hotels, the Hilton Reforma is a great historic center option as is the Marriott and the Sheraton which are both located along the parade route on Paseo de la Reforma. Of course, you don’t have to stay in the Centro Historico to enjoy all of the parties that take place during the Day of the Dead. 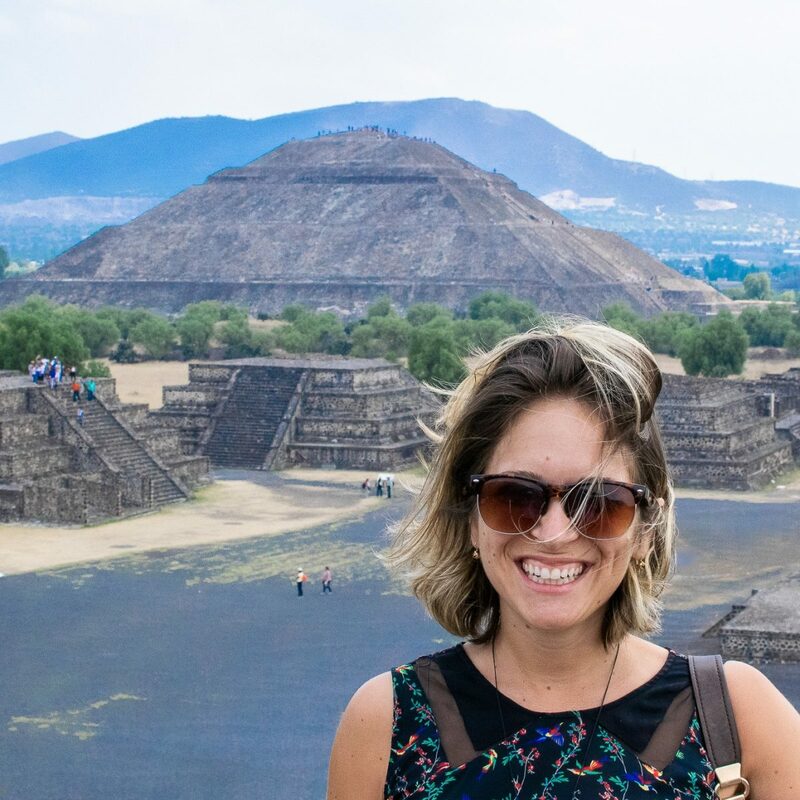 If you want to enjoy all that the city has to offer, you can stay in Roma or Condesa – two of my favorite neighborhoods for restaurants and bars. My absolute favorite boutique hotel in Roma is La Palomilla. Their rooms are gorgeous and it doesn’t get better than their rooftop area where you can chill with a book or a beer (or both). Read my full review of La Palomilla here. For a great spot to stay in Condesa, check out Condesa Haus. It’s a cool converted mansion with amazing art deco touches and seriously stunning tiles. You can read my full review of Condesa Haus here. I LOVE that the city fathers (city parents?) of Mexico decided to take advantage of the… flexible and creative… approach to reality that the screenwriters and director of a Hollywood movie had chosen to take with their city. Anyhoo, thanks for this close-up of the current realities that they’ve now created, in their choice to exploit and realize that formerly fictitious phenom. Looks like a ton o fun. Sounds awesome. Myself, husband and two adult children are going to head there in 2019. I will keep a watch for all activities. We were also thinking Spain. Do you recommend any area over another? Do you mean Spain for Day of the Dead or just to visit in general? From my knowledge, Day of the Dead is celebrated solely in Mexico. It’s based around an ancient holiday that was celebrated well before the Spanish arrived here. If you simply mean to visit – they’re so different and both have some seriously amazing cities, food, and sights to explore! Mexico is a bit friendlier on the wallet if that helps with your decision?